The Human Clock™: Turn on the 2009 news! Looks like you haven't been here long enough to have wasted any time. I need a humancalendar.com model for "2010". You'd need to sign a release and be able to come to my freezing garage in the Portland, OR, USA area. Prefer someone that is out of the age 25-35 and/or caucasian demographic, but anyone is welcome. You can contact me via the contact page if interested. The Flaming Lips were shooting a video near my house today up at Mt. Tabor. I went over there and participated in the video. It involved a lot of bicycles and people being naked...it was quite an experience! I shot a lot of "making of" photos and video...but will leave them offline until the official video comes out. Parks containing an extinct volcano with basketball courts in their crater surely must inspire great videos like this one today, since it definitely worked on my current favorite video of all time, which was shot on the south side of the park. Anyway, during a break I showed Wayne Coyne my tattered photobook and he posed for a clock photo. Later on I got a clock photo of his wife Michelle, holding a clock photo I took back in 2002 when I was biking around Australia. Nice group of folks that whole bunch was. Whelp, they rolled into town, played a show, stayed with Cora, Bonzi, and I, and now the band rolls out of town. I'm a bit behind in getting clock photos into the site since I finally got normal (eg Broadband) net access again. Nothing else to add, but the next time you do laundry, be sure to to sing in your best Chris Cornell voice: "I'm doin' laundry....I'm doin' laundryyyyyyyyyyyyyyyyeaaah!!!" 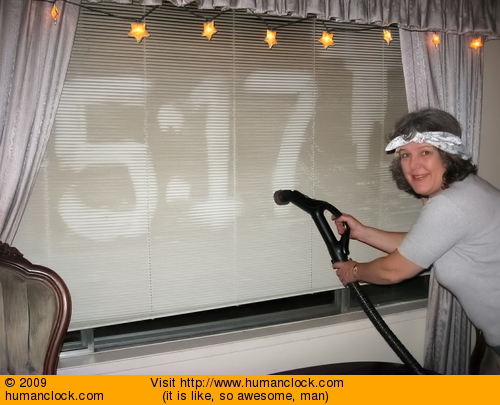 First off, I have a humanclock Twitter account for the clock site but hardly ever use it due to lack of followers/etc. I should be using it more once the new site is done. You can follow it if you wish. Secondly, one of the more unique photos submitted in recent memory, thanks again to the wonderful crazyphotoman. Cora and I are gonna be going to New Orleans at the end of April. After that I'm going to make my way back to Portland via Greyhound/Amtrak, taking clock photos the whole way back. I'm excited to get a chance to walk around everywhere and take clock photos of people and things. I haven't been able to do this for a little while and always enjoy doing it. Over the last year or so people have been asking about having an iPhone app for the clock. That will probably come out at the same time as the new clock site (in a few months). Work on the new humanclock.com site is progressing along, although I don't know exactly when it will be done since there is a lot of stuff/work/things to do still. To answer many people's questions, yes the new site will have an embeddable version so you can put the Human Clock on your website. The embeddable version of humancalendar.com has been really popular so I really want to get one done for this website also. On another note, I did manage to stop working on the new site long enough to, along with Atari Yoga Girl, go see Herman Dune play last night at Holecene. They even posed for clock photos afterwards. Nice guys! Try and see them if they are coming to your town. They have many cute videos, plus I also posted some parts of the show last night on the humanclock channel of Youtube. A couple of quick economic notes. I have an upside down map of the world that I bought in New Zealand. I gave it to my parents for Christmas but somehow it founds its way into a box marked "Craig" that my mom gave me when I went home last. Buy now [link expired] and amaze your friends! My friend 9:03 Bryan moved to Indiana recently and opened up Compass Chiropractic Indianapois, so if you live nearby and have back issues, you can go see him. On March 13th, 2003, five minutes after I finished a 13 month bicycle trip around the Australian continent, a guy was berating me that "Americans needed to do something about Bush". I can say that they finally have in a figurative sense. Not to get all poli-ticsy, but even if Obama doesn't actually end up riding a metaphorical unicorn over rainbows and instead does metaphorical burnouts in his '72 Ford Pinto, at least I won't have to walk out of a hostel full of laughing foreigners because my president is on the TV. It is a New Year and I have um, a lot more free time now! 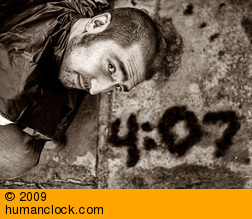 Expect a new humanclock.com site and a more diverse group of people on humancalendar.com. I recently moved everything to (a lot) faster server so this should handle some load issues that were showing up daily around 11am. (when everybody is at work watching the clock instead of working). I haven't made any videos lately, but I would like to share probably one of my favorite music videos of all time, or as Ezra Caraeff from the Portland Mercury describes it: "The single greatest video in the history of ever". This guy I know, Aaron, is in a band called Red Fang, and along with Whitey McConnaughy they made a video a few months ago for their song "Prehistoric Dog". I saw this video and it became part of my morning routine for a good three weeks: Wake up, drink coffee that Cora made earlier, turn on computer, read salon.com, watch Red Fang video, read slashdot.org, answer email, process clock photos, watch Red Fang video, and so on. An even bigger bonus is that it takes place on my jogging route! Anyway, they are going on tour soon so you can catch them if they are in your area, although they might be leaving the costumes at home. Since I know more people view this site at work than at home, the video is probably safe for work, especially if your boss likes a lot of mayhem and Monty Python references.